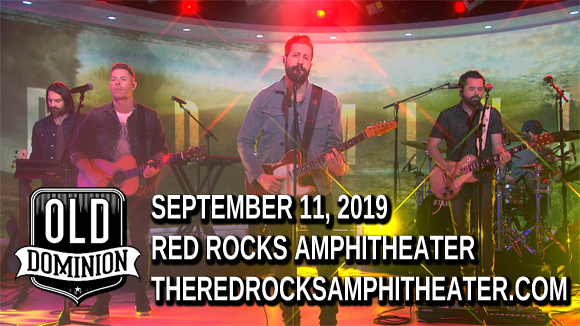 Country rock five-piece Old Dominion comes to Red Rocks Amphitheater on Wednesday 11th September 2019 for a night of award-winning music from one of the most dynamic country bands around! Performing as part of their Make It Sweet Tour, Old Dominion will be serving fans up some tasty goodness in the form of fun, sunny and occasionally raucous Americana! Old Dominion are a Nashville-based country-rock five-piece, formed in 2007. The group first began making waves on the country music scene in 2014, when they released a self-titled EP. Before that, the individual band members had each been working as songwriters for various artists (including Luke Bryan, Cole Swindell, Randy Houser, Kenny Chesney, Kelsea Ballerini, Blake Shelton and Dierks Bentley, among others) and they originally got together to showcase their songs to each other. However, their EP was well received and the group decided to release a debut album, Meat and Candy, in 2015, launching the singles "Break Up with Him", "Snapback", and "Song for Another Time". The following year, the band won the ACM Award for New Vocal Duo or Group of the Year, and in 2017 they released their sophomore album, Happy Endings. Returning to the ACM Awards in 2018, Old Dominion took home the award for Vocal Group of the Year.